In order for this method to be effective, you need to make sure and keep your binder up to date. Go through your binder each quarter and make necessary changes and updates. Perhaps your insurance or prescription info has changed? Maybe its time to update the kids photos and heights/weights. Keeping things up to date will help this be an effective tool to keep your family organized. 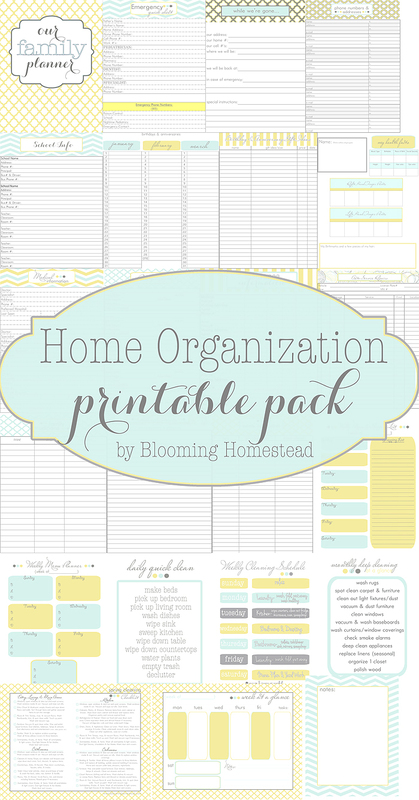 We offer 3 styles of home organizational printables for free. 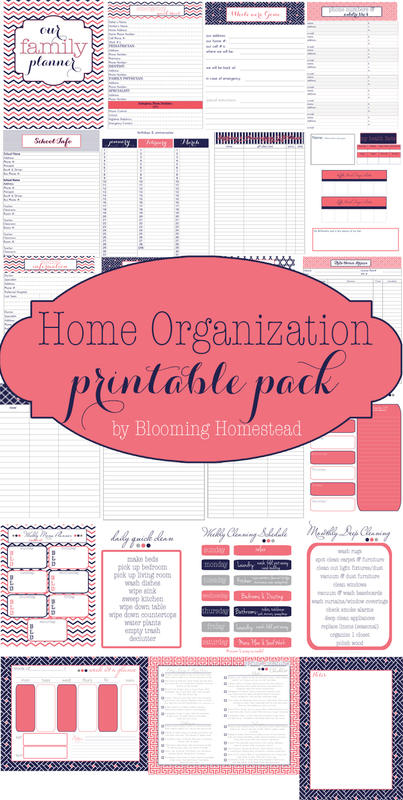 Love our Floral Home Organizational Printables? These are available only to our awesome subscribers…sign up below for awesome printables, updates, and project ideas. These are awesome!! I can’t wait to use them; thank you so much! Thanks for the help I really need to get my act together this year – this should help. I just wanted to let you know how much I appreciate your 2013 calendars! I work for a hospice organization in South Carolina as a Volunteer Coordinator and I printed these calendars out for my hospice volunteers to use when scheduling their patient visits. They enjoyed receiving these so much as I made each of them a binder to keep all of their papers in. I wanted to share this bit of information with you and again, thank you!! Yesterday I paid $20 for a pdf organization kit on a deal from Very Jane, and today I saw this. This is much cuter, by the way. I’m annoyed with myself but luckily the other set I paid for is grey chevron so I will use yours and mix them with the set I bought. I think it is so wonderful that you provide these for free. I wish I knew how to design these files but you do it better and cuter than I ever could. Thank you so much for your generosity. These are absolutely wonderful, I have quite the printables addiction and these are just really beautiful! I cannot seem to print the monthly deep clean schedule. It keeps showing up as blank. Can you help me? These are amazing! I am moving my family of five to a different province in less than two months and was craving a way to not only organize all of the new information (school info, doctors, etc) but also manage day to day life with three kids… this is it and they are so cute too!! Thank you so much for the time and effort and for providing these for free. I love your printables. They are so pretty and helpful. For some reason I can’t get access to the weekly menu planning link or the menu planning with shopping list. It looks like they may have been disabled. Is it possible to still get these printables? Hi Emily, I will double check those links…if you email me at bloominghomestead@gmail.com I’ll email the files directly to you so you don’t have to fuss with downloading. I love these! This is exactly what I have been searching for! Do you have the sets available for downloading? I couldn’t find the link. Thanks again! Hi Kate, I should have the updated links available shortly after Christmas. Sorry it is taking me forever! I do offer then in Coral and Navy which show up a bit better. I also have my printed at staples because the color prints truer and richer than my home printer. Hope that helps! How do we print the navy and coral colored ones? Hi Sabrina, you should be able to click on the link and it will take you to dropbox. If it asks you to sign in you can just close the box with the “x” and it will let you go right to the download page without creating an account. If you need me to email the file to you directly, just email me and let me know! I was wondering if you could tell me what program you used to create these or send me a customizable/non-pdf copy of the yellow one? There were a couple of small tweaks I wanted to make to make it fit our situation. Hi Shelli, I create these with a variety of programs including photoshop, publisher, pages, microsoft word and excel. I’m sorry I don’t have a customizable option at this time. Hi, I am not able to download any of the organization binder printables. If you have time, could you assist me with that? Thanks you so much. Hi Lori, I would be happy to email you the files. The floral home organization set are for subscribers only, and you an sign up for it here. I love your website and all of your free printables. they are so great. Thanks a lot for the beautiful floral home binder. Its a life saver. I am addicted to you site now! keep going. I can’t get the coral and blue to work.. are they still available? They are still available. You can email me at bloominghomestead AT gmail DOT com and I can email the file to you. Hi there, you can subscribe here. I have tried to subscribe, but every email I use, I get an error that my email address is invalid. Help! I love you printables. Thanks!